For the second time in its history, Revesol arrives to the Asian continent, this time to the south eastern part of the region. 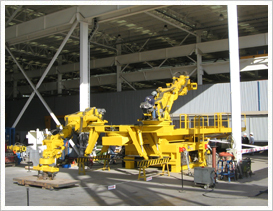 The company developed a sale of a Double Boom Mill Liner Handler machine in LAOS for mining operations in that country. The equipment was purchased by an Australian mining company that has mining activities in the region, specifically a silver ore mining project. After a long process of negotiation, finally the company trusts in Revesol between other companies. Revesol arrived for the first time to Asia with an operation in the Middle East.